Though it may not be quite as contradictory to my Canadian self-identification as my dislike of maple syrup, I’ve never felt particularly drawn or sympathetic to the character of Wolverine. I’ll grant he’s somewhat endearing when portrayed in films by that charming Aussie song-and-dance man – and a less mystifying object of admiration than Deadpool – but I wonder if I’d even have a passive investment in him were he not Canadian. Admittedly, I wonder the same thing about Justin Bieber and Céline Dion, but I digress. Laura Kinney is no newcomer to the Marvel Universe. 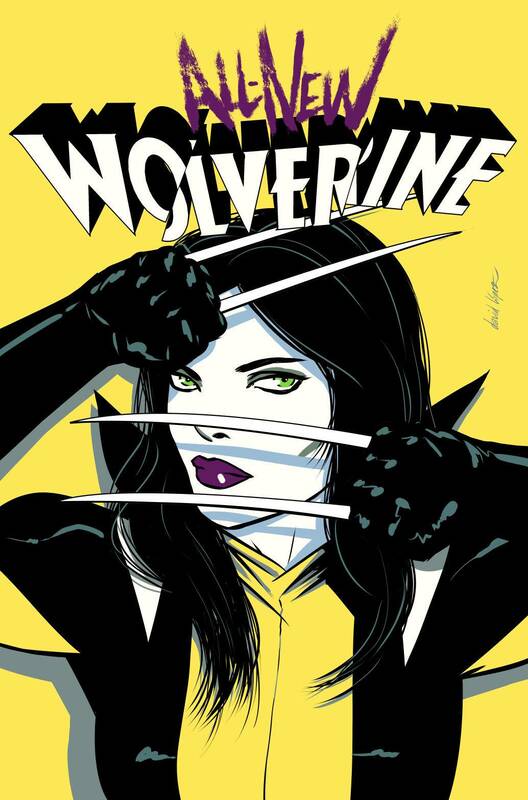 She’s canonically a clone of the original Wolverine (so she bears a few key supernatural similarities to him) and has been in her fair share of her own mutant misadventures, going by the name “X-23”, so it’s hard to imagine a less controversial successor for Logan. Also, I’m glad I didn’t need to know more than that to navigate my way through the first three issues of All-New Wolverine. In the opening pages of the series debut I was sucked into the action. A brief flashback shortly thereafter fed some backstory details and set a nice tone and subtext for what lies ahead, both in this story arc specifically and in the bigger picture of the character’s future challenges and development. It seems like there’s a lot to explore with this character in her new role and I’m optimistic that readers like me will keep getting to do just that. Though it’s still early in the series, it’s hard to find any fault with writer Tom Taylor’s narrative to this point. He efficiently delivers adventure, intrigue, and some well-timed humour, which is always refreshing. And it was surprisingly easy to get invested in the characters who have been introduced thus far. In the first three issues, every panel of art by David Lopez, David Navarrot, and colour art by Nathan Fairbairn complements the story’s moments, both epic and subtle. I especially enjoyed the many atmospheric and architectural details in #1, which is set in Paris. Though that may, in part, have had to do with Angel (about whose background with the X-Men I know very little) swooping over the Seine, which reminded me a bit of the opening credits of Condorman, a movie which will forever be near and dear to my heart. Speaking of credit, it’s certainly due to another member of the comic’s creative team. I’d argue that lettering is particularly important in a Wolverine or Wolverine-related title and, though I may not know much about Logan’s legacy, I can appreciate and be grateful that every snikt is in the competent, capable hands of Virtual Calligraphy’s Cory Petit. I’m definitely looking forward to #4 in this series and am tempted to go into Marvel’s back catalogue and learn more about X-23, though I’m pretty sure she’s never previously had a costume as rad as this one. I might also investigate the recently relaunched All-New X-Men to see her as part of a team and report back. So many comics, so little time… but now, more than ever, there seems to be something for everyone. Unless you want to read a Condorman comic. Though I’m hoping that might change if the remake rumors are true.